Just in time for chilly weather and cold season, this Creamy Chicken Rice Soup Recipe is comfort in a bowl. 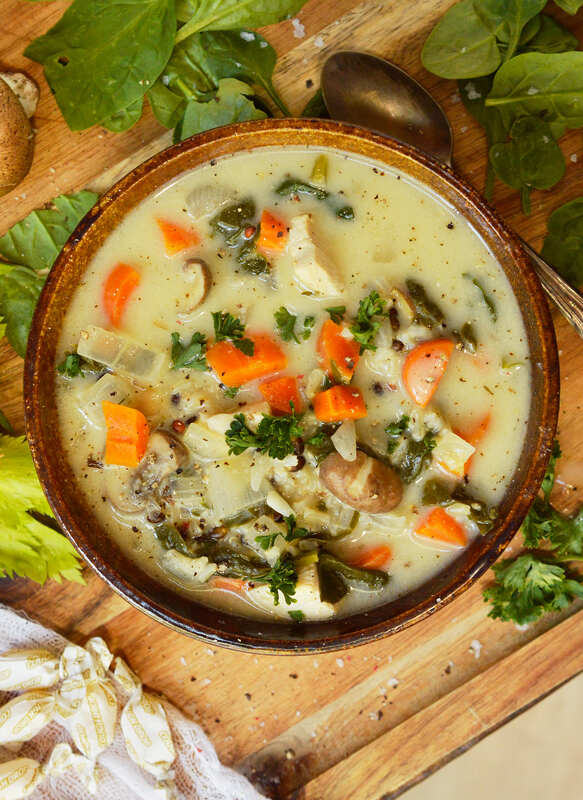 The addition of fresh spinach and mushrooms make this soup extra satisfying and nutritious. 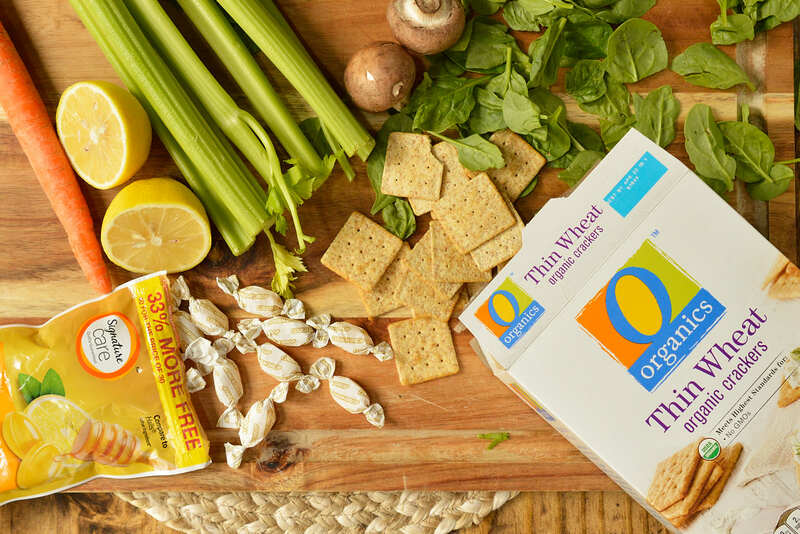 The perfect healthy meal to make you feel better! Along with the crisp cool Fall days, Pumpkin Spice Lattes and colorful leaves comes the beginning of cold season. At least once every winter my daughter and I get a brutal cold. I always muster up enough energy to make a big pot of comforting soup to make us feel better. 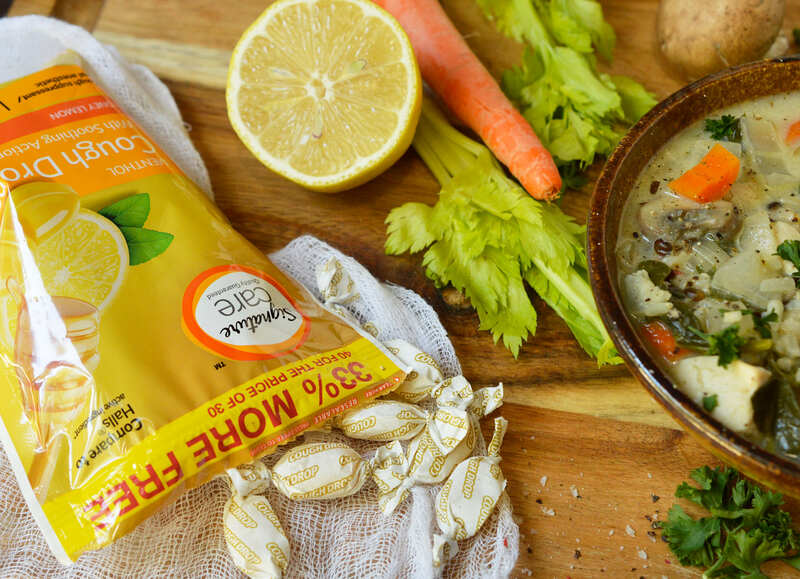 This Creamy Chicken Rice Soup Recipe is great for nursing a cold because it has the warm comfort of chicken soup with some extra vegetables to make it even more nutritious. Along with a bowl of chicken rice soup, Signature Care™ products from Safeway can help to get you feeling better. 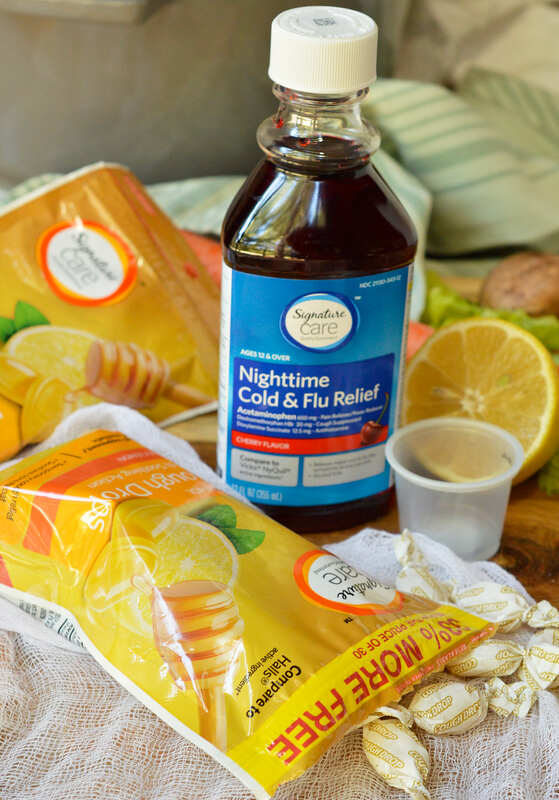 I like to use the Signature Care Honey Lemon Cough Drops to soothe my sore throat and the Signature Care Nighttime Cold Medicine to get some rest. Signature Care products are pharmacist recommended and include all the same ingredients as the national brands, but at a better value. Signature Care products are available in California exclusively at Safeway, but you can find them at all Albertsons Companies stores including Albertsons, ACME Markets, Jewel-Osco, Vons, Pavilions, Randalls, Tom Thumb, Shaw’s, Star Market, United Supermarkets, Market Street, Albertsons Market and Carrs/Safeway. 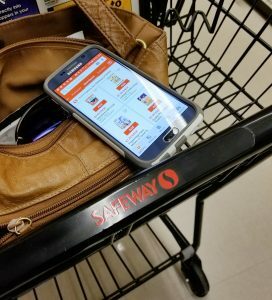 I love shopping at my local Safeway because of the great deals and fantastic products! I always find everything I need. The best part is that you can pick up all of the soup ingredients and the Signature Care products at your local Safeway. One stop then you’re on your way home to cozy pajamas, tissues and a warm bed. I’m a big soup fan, especially during the cold winter months. I love how quick, easy and nutritious homemade soup is. 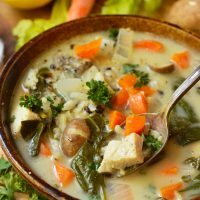 Here are a few more of my soup recipes: Lemon Pepper Chicken Soup, Easy Tomato Soup and 30 Minute Broccoli Cheese Soup. And you don’t have to be sick to eat this soup. 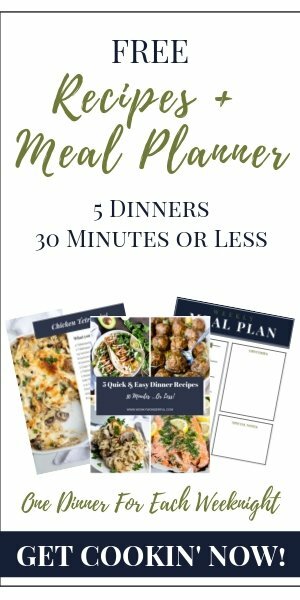 This is an absolutely delicious family dinner that is sure to be a new favorite! So get prepared. Head down to Safeway and stock up on your Signature Care products. That way you’ll have them when you really need them. Just in time for chilly weather and cold season, this Creamy Chicken Rice Soup Recipe is comfort in a bowl. 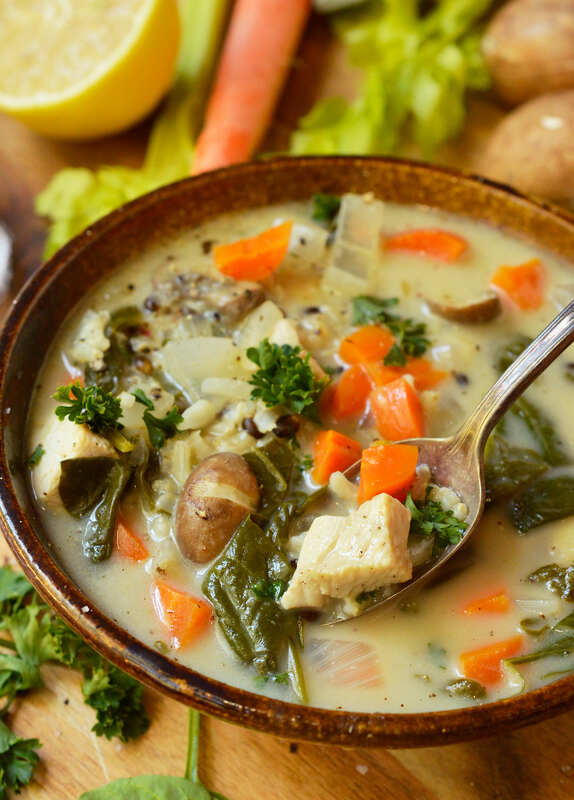 The addition of fresh spinach and mushrooms make this soup extra satisfying and nutritious. In large soup pot over medium/high heat, saute carrots, celery, mushrooms and onion in oil for 10 minutes. Stir in flour, garlic powder, onion powder, poultry seasoning, salt and pepper. Gradually stir in chicken broth then add lemon juice. Bring to a boil then add chicken. Reduce heat and simmer 5-7 minutes or until chicken is cooked through. Stir in heavy cream, spinach and cooked wild rice. Simmer 5 minutes. Salt and pepper to taste, then serve. I was looking for a good soup recipe and this one seems very palatable! Can I use red onion for this soup?